Shantae has come a long way since her origins on the Game Boy Color back in 2002, ending up severely overlooked thanks to the Game Boy Advance launching the year before. It wasn’t until 2010 that she got a sequel in the form of Risky’s Revenge, released via DSiWare and later on iOS and Steam. Now in 2015 (2014 for Americans) Shantae returns yet again to take us on another adventure. Shantae who is known for being a “half-genie” has lost her genie powers – yet finds herself having to protect Scuttle Town from the dangers which come from outside regardless. Unlike the previous games, her nemesis Risky Boots moves from antagonist to ally; teaming up with Shantae to take on this game’s real villain – the Pirate Master. 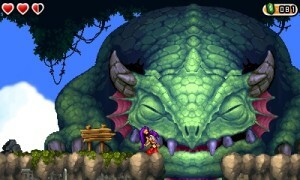 The gameplay hasn’t changed much from the earlier two games, 2D adventure platformers affectionately described as ‘Metroidvanias’. 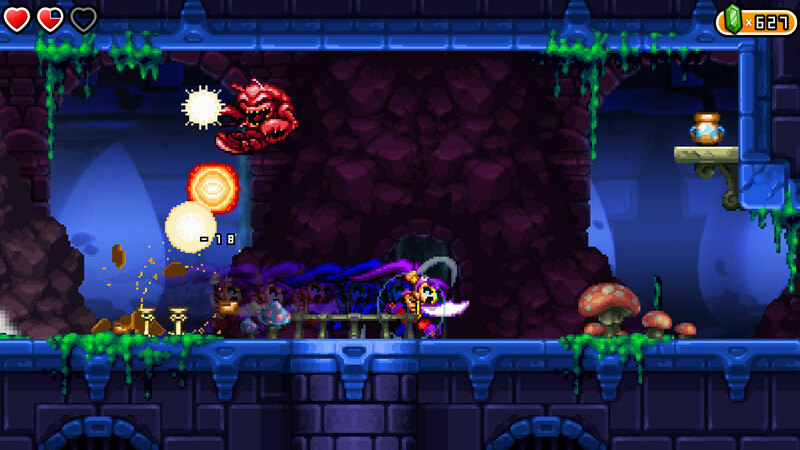 Shantae still uses her hair to whip her enemies, increasing the attack and speed with purchasable items. New to this game are pirate-themed items such as pistols and a huge pirate hat to help glide to hard-to-reach areas. These new additions give Shantae a different feel to her previous outings and they’re put to good use in terms of solving the game’s puzzles. Pirate’s Curse is set on several islands which are easily accessed via Risky’s Ship (as opposed to Risky’s Revenge‘s singular overworld), simplifying backtracking a great deal. 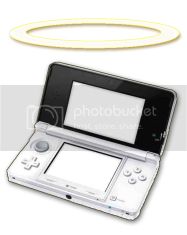 The 3DS touchscreen is used for displaying your inventory, key items, and a map of the current area you’re in. Items are just a screen press away, making it easy to keep track of your Potions and Pike Balls in the thick of battle. Collectable items are as important to the series as ever – each island hides four Heart Squids that can be exchanged for bonus health, taking a cue from another famous Action Adventure game series. Jake Kaufman keeps his place as Wayforward’s in-house composer and definitely earns his keep – going for a high-fidelity sound rather than the retro chiptunes he’s famous for. Breakdowns and remixes of classic Shantae themes appear frequently, grimier than you’ve ever heard them. Pirate’s Curse has upped the level in the graphical department from Risky’s Revenge, whilst keeping the art style from the series. The backgrounds look beautiful in 2D and the 3D aims to give a sense of depth to weather and particle effects. 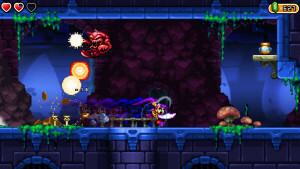 The characters’ sprites are vividly animated from Shantae’s characteristic (and arguably unnecessary) “jiggle” to the NPC’s highly detailed idle animations. The islands, while not imaginatively themed (a swamp island, a frozen island, a desert island, you know the deal), are well rendered and vibrant, pushing the better resolution the 3DS has over its predecessor. Shantae and the Pirate’s Curse is an excellent game, robust and complete in a way its prequels never quite reached. It’s a short game to finish, around 7-8 hours for a non-completionist initial run. That said, there’s a New Game+ mode with a bonus feature of two that could add replay value. 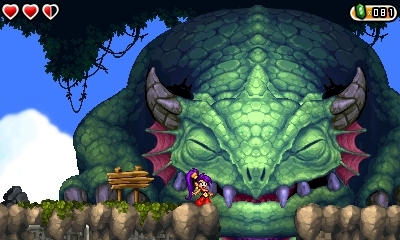 For those wanting more Shantae action, her upcoming game Half Genie Hero will be coming out later in 2015. Great graphics and background effects. Level design is great and varied. Has replay value due to new game mode. Kind of short, but not to the extent of Risky’s Revenge. Fanservice can be off putting to some.